Well, looks like the 2007 law phasing out 100-year old incandescent light bulb technology in favor of newer light bulbs that waste less energy while providing more efficient lighting options is working. Light-emitting diode (LED) light bulbs have improved their efficiency roughly 50% and expanded consumer options as federal regulations have tightened, according to a report from the U.S. Energy Information Administration (EIA). 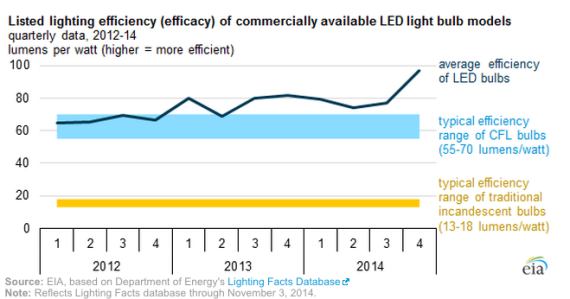 At the same time, LED prices have continued dropping “dramatically” according to EIA, to the point where they make long-term economic sense for consumers even without government energy efficiency incentives. Between 2012-2014 LED efficiency jumped from just over 60 lumens per watt to nearly 100 lumens per watt, and they may hit 150 lumens per watt by 2020. Compare LEDs to compact fluorescent lights (CFLs) with 55-70 lumens per watt, and traditional incandescent bulbs with 13-18 lumens per watt, and the LED advantage is bright as day. 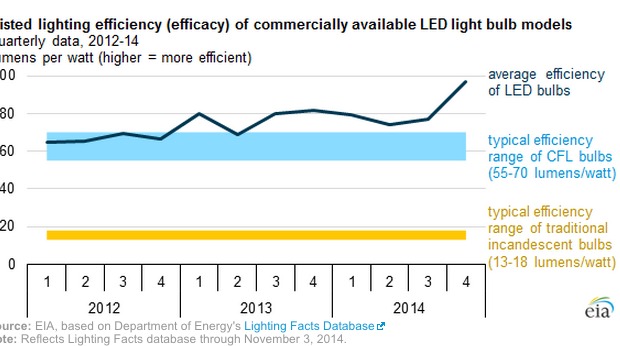 LED manufacturers are not only increasing efficiency, they’re expanding options. EIA reports several manufacturers released Energy Star-qualified LED bulbs surpassing 100 lumens per watt in September 2014. That competition is pushing prices down accordingly – the first LED priced below $10 hit the market in 2013, and North Carolina-based Cree just released a 60-watt equivalent LED that costs $7.97 but generates $135 in lifetime savings. The lower-cost trend will likely continue as millions in R&D funding for LEDs starts driving innovations. Consumer costs have been lowered even further – in some cases as low as $1.97 per LED bulb – through dozens of energy efficiency incentives. EIA estimates consumers received $400-470 million annually between 2011-2013 on efficient lighting through the Energy Star program, which maintains a list of available U.S. energy efficiency incentives online. As a result of falling prices and favorable incentives, LEDs keep gaining market share. LED shipments skyrocketed from around 9 million light bulbs in 2011 to over 45 million bulbs in 2013. That’s good for around 2.3% of the general lighting market and combined with CFL shipments of 300 million annually since 2011, mean efficient lighting now makes up nearly a quarter of the U.S. lighting market. Can LED Lighting Overcome The Color Rendering Index? But even with all these cost and efficiency improvements, there’s still one aspect of lighting where LEDs don’t compete – the “warmth” of light given off by the bulb, as measured by the color rendering index (CRI). Traditional incandescent bulbs have a CRI around 100, and while many LEDs have CRIs ranging from 20-30 (meaning a “cool” light), EIA notes several LED manufacturers have produced CRI values above 80. But again, technological advances are cutting that gap, as with Cree’s 2013 release of an LED with a CRI of 93. 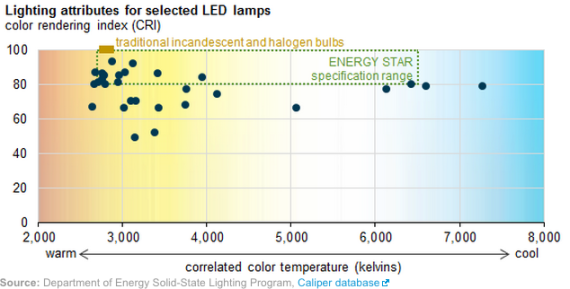 EIA also notes consumer studies report low correlation between consumer ranks and CRI values, meaning a low CRI doesn’t mean poor light quality. And besides, with so many potential benefits to using LEDs combined with the positive low-cost and high-efficiency momentum, it’s going to take a lot more than just “cold” light to dim the outlook for efficient lighting.